Punyaslok Rajmata Ahilyadevi Holkar (May 31, 1725 – August 13, 1795) (ruled December 11, 1767 – August 13, 1795) of India ruled as a Holkar dynasty Queen of the Malwa kingdom, India. Khanderao Holkar, Ahilyadevi's husband, died in the battle of Kumher in 1754. Twelve years later, her father-in-law, Malhar Rao Holkar, died. She inherited the throne and became one of India's great women rulers. Upon taking the throne as queen, she launched a campaign to rid her kingdom of Thugs who sought to plunder the kingdom, personally leading her army into battle. Her war time exploits became legendary. Ahilyadevi earned a reputation for administering justice fairly during her rule without partiality or partisanship. She sentenced her only son, found guilty of a capital offense, to death by being crushed by an elephant. Rani Ahilyadevi ordered the building of a multitude of Hindu temples in Maheshwar and Indore. She built temples and Dharamsala at sacred sites in many other places including Dwarka in Gujarat east to the Kashi Vishwanath Temple at Varanasi on the Ganges, Ujjain, Nasik, and Parali baijnath. She ordered the rebuilding of a temple destroyed and desecrated in Somanath, which is still used as a worship place by Hindus in 2008. Ahilyadevi has been compared with Catherine the Great, Queen Elizabeth, and Margaret I of Denmark. Ahilyabai was born on May 31, 1725, in the village of Chondi, Taluka Jamkhed District, in Ahmednagar, Maharashtra. Her father, Mankoji Shinde, was the patil of the village, a member of the proud Dhangar community. Women then did not go to school, but Ahilyabai's father taught her to read and write. Her entrance onto the stage of history had been accidental. Malhar Rao Holkar, a commander in the service of the Peshwa Bajirao and lord of the Malwa territory, stopped in Chondi on his way to Pune and, according to legend, saw the eight-year-old Ahilyadevi at the temple service in the village. Recognizing her piety and her character, he brought the girl to the Holkar territory as a bride for his son, Khanderao Holkar (1723–1754). They were married in 1733. Proceed to Gwalior after crossing the Chambal. You may halt there for four or five days. You should keep your big artillery and arrange for its ammunition as much as possible…. On the march you should arrange for military posts being located for protection of the road." Already trained as a ruler, Ahilyadevi petitioned the Peshwa after Malhar’s death, and the death of her son, to take over the administration herself. Some in Malwa objected to her assumption of rule, but the army of Holkar expressed enthusiasm about the prospect of her leadership. She had led them in person, with four bows and quivers of arrows fitted to the corners of the howdah of her favorite elephant. The Peshwa granted permission, and, with Tukoji Holkar (Malhar Rao's adopted son) as the head of military matters, she proceeded to rule Malwa in a most enlightened manner, even reinstating a Brahmin who had opposed her. Ahilyadevi never observed purdah but held daily public audience and was always accessible to anyone who needed her ear. Among Ahilyadevi's achievements, she developed Indore from a small village to a prosperous and beautiful city. She made Maheshwar, a town on the banks of the Narmada river, her own capital. Ahilyadevi built forts and roads in Malwa, sponsored festivals and served as a patron for many Hindu temples. Outside Malwa, she built dozens of temples, ghats, wells, tanks, and rest-houses across an area stretching from the Himalayas to pilgrimage centers in South India. The Bharatiya Sanskritikosh lists as sites she embellished, Kashi, Gaya, Somnath, Ayodhya, Mathura, Hardwar, Kanchi, Avanti, Dwarka, Badrinarayan, Rameshwar, and Jaganathpuri. Ahilyadevi also rejoiced when she saw bankers, merchants, farmers, and cultivators rise to levels of affluence, but rejected claims to any of that wealth, be it through taxes or feudal right. She financed all her activities with the lawful gains obtained from a happy and prosperous land. Since India's independence, the city of Indore, when compared to neighboring Bhopal, Jabalpur, or Gwalior, has progressed dramatically: economically, through business and financial development, and politically through the development of efficient administration. The local population proudly states that they live in 'mini-Mumbai', a reference to the great metropolis 600 kilometers away. Ahilyadevi’s legacy of good deeds, her dedication to religion, and her policies served to enrich the city into the twenty-first century. Stories of her care for her people abound. She helped widows retain their husbands’ wealth. She made sure that a widow was allowed to adopt a son. In one instance, when her minister refused to allow an adoption unless he was suitably bribed, she sponsored the child herself, and gave him clothes and jewels as part of the ritual. The only time Ahilyadevi seems not to have been able to settle a conflict peacefully and easily was in the case of the Bhils and Gonds, "plunderers" on her borders. She granted them waste hilly lands and the right to a small duty on goods passing through their territories. Even in that case, according to Malcolm, she did give "considerate attention to their habits." 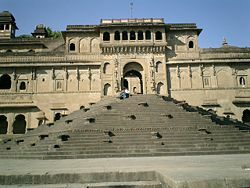 Ahilyadevi’s capital at Maheshwar was the scene of literary, musical, artistic, and industrial enterprise. She entertained the famous Marathi poet, Moropant and the shahir, Anantaphandi from Maharashtra, and also patronized the Sanskrit scholar, Khushali Ram. Craftsmen, sculptors and artists received salaries and honors at her capital, and she established a textile industry in the city of Maheshwar. The reputation of Ahilyadevi Holkar in Malwa and Maharashtra has been established as that of a saint. She proved a magnificent, able ruler, and a great queen. 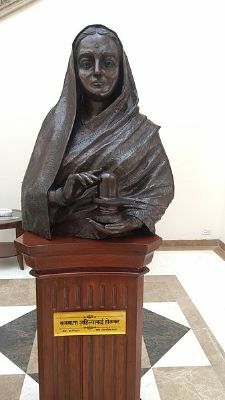 In 1996, to honor the memory of Ahilyadevi Holkar, leading citizens of Indore instituted an annual award in her name to be bestowed on an outstanding public figure. The prime minister of India presented the first award to Nanaji Deshmukh. The government of the Republic of India issued a commemorative stamp in her honor on August 25, 1996. As a tribute to the great ruler, Indore domestic airport has been named "Devi Ahilyabai Holkar airport." Similarly, Indore university has been christened Ahilya University, Indore A film titled Devi Ahilya Bai was produced in 2002 featuring Shabana Azmi as Harkubai (Khaanda Rani, one of Malhar Rao Holkar's wives) and also including Sadashiv Amrapurkar as Malhar Rao Holkar, Ahilyabai's father in law. The reign of Ahilyabai, of Indore in central India, lasted for 30 Yrs. This has become almost legendary as a period during which perfect order and good Government prevailed and the people prospered. She was a very able ruler and organizer, highly respected during her lifetime, and considered as a saint by a grateful people after her death." ↑ Kewal Krishan Mittal, Keshav Wagh, and Harishchandra Barthwal, The integral spirit of Bharat, an eulogy: Bhārata ekātmatā stotra, an explanation; with colored illustration (New Delhi: Suruchi Prakashan, 1997), 97. ↑ Stewart Gordon, The Marathas, 1600-1818. The new Cambridge history of India, II, 4 (Cambridge [England]: Cambridge University Press, 1993), 160. ↑ Walter Yust, Encyclopædia Britannica; a new survey of universal knowledge, v. 11 (Chicago: Encyclopædia Britannica, 1957), 18. ↑ John Malcolm, A memoir of Central India, including Malwa and adjoining provinces, with the history and copious illustrations of the past and present conditions of that country (Calcutta: Thacker, Spink and co., 1880), 152. ↑ Commemorative Stamp Retrieved February 1, 2009. ↑ Devi Ahilya University, Indore Retrieved February 1, 2009. ↑ Devi Ahilya Bai Retrieved February 1, 2009. ↑ Jawaharlal Nehru, The discovery of India (New Delhi: Penguin Books, 2004), 304. This page was last modified on 9 February 2019, at 16:49.